Like this post? - Please share it! Mongolia is a fantastic outdoor destinations! Amazing national parks, mountains, dessert, forest, wide open spaces… Mongolia has it all. Mongolians are some of the most friendly people you will ever meet, and they love kids – making this the perfect family outdoor destination as well. We have been lucky enough to call Mongolia home for a time. We were there for 8 months, and it is one of those places that just never cease to amaze you. While we did not see everything in those 8 months – and neither will you if you have a vacation there – we did see a lot of it, and here are some of the things that we would go back and see again, and definitely recommend that you see as well. Chances are you will land here, either by plane, or by train. Do yourself and your family a favor and stay here for a few days. Book a guide to show you some of the sights in the city. There are great lookouts around the city for you to get a feel of it, and we recommend that you visit the national history museum, and the black marked as a minimum. 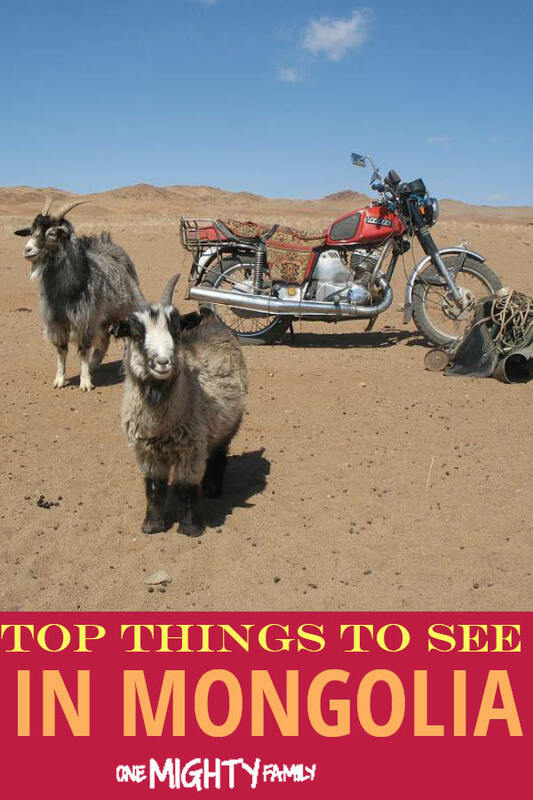 There are plenty of things to see in the Gobi dessert. There are amazing wildlife, camel tours and a glassier. Furthermore there is the opportunity to see dinosaurs right there, in the sand, as they would have been left there millions of years ago. Absolutely amazing! While you can see many things hiking, Mongolia has many horses and it is easy to setup a tour of horseback riding. This is fun for everyone, and a good way to see an area. The horses are usually well behaved and used to turists. While most visitors go to khovsgul by car, and drive up the western side of the lake, it is a fantastic experience to see the lake from the water. If you have the option to do so, have your guide arrange a boat tour on the lake. While you are there you might do some fishing, or talk to some of the local fishermen – the fish from here are amazing. You will not find many countries as friendly and open to tourists, as you will find Mongolia. You will always find an open door and people ready to welcome you inside for a cup of the. Consider asking a local guide to set up a visit for you, and if you do, make sure to bring something along as a thank you for taking you in. This amazing place gives you a feel of what it must have been like during the time of Gjingis Khan. Not only it is an amazing experience to see the eagles working with their human friends, but this festival takes place in the far west of Mongolia, a very different region of the country. That in it self is an experience. There are a few great festivals in Mongolia, and they are all worth the experience. Nadam festival showcases some great skills of the Mongolians, while celebrating the great Gjingis Khan. The Nadam festival is in the beginning of July. Sarrensar is the new moon celebration in the end of January. This is another time where the Mongolians celebrate with friends and family. Eating plenty of food and drinking vodka. Through out mongolia there are hot springs. Some of them have ger parks near by, and others are like a day spa. Hire a guide to take you to one. Especially if you visit during the cold months, this is a great way to be warm. There are different Buddhist temples through out Mongolia and they are beautiful places to just be, and reflect on life. Now while you can go around in Mongolia on your own, we suggest to hire a guide. Your guide and driver are essential for your experience in Mongolia, and they will quickly be part of your family. You will be able to talk to them about what you like, and with their knowledge of the area and the locals they will find you little hidden gems. We have eaten fresh fish straight from lake Khovsgul, sleept with a local nomadic family in the Gobi, seen dinosaurs in Gobi, and seen the construction of a power dam on this account, just to name a few. We LOVE Mongolia. If there is any other things you would like to know, or advice you need, please comment below, and we will help if we can!